Complete retail design and retail graphics solutions from retail barricade graphics to retail exterior signage to interior retail graphics. Welcome to AGRetail, a product line of The AmGraph Group, based in Greater Los Angeles. 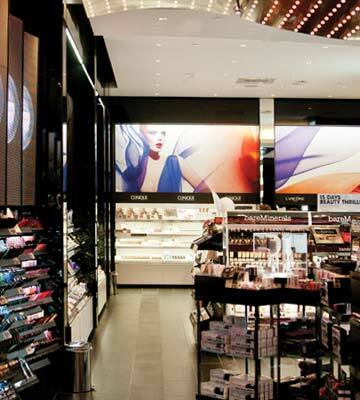 We provide retail graphics and retail design solutions across North America. We are a hybrid of a creative advertising agency combined with a premium print production facility. Our line of products and services specializes in Retail Brand Creation, Retail Brand & Graphic Implementation and Management. We take the marketing messages of our retail clients and apply them nationally and internationally into multiple graphic platforms. At the core of our business we facilitate in the design, print and installation of many retail graphic applications including construction and retail barricade graphics, shopping mall barricade graphics, retail storefronts, retail interior signage, event and grand opening kits, banner programs, corporate fulfillment websites, electronic media, specialty non-illuminated signage and much more. AGRetail not only create new brands, but also specialize in the management of existing retail brands and corporate identities through our brand implementation services. Many of the largest retailers, business organizations and institutions look to AGRetail to provide this level of brand management to ensure consistency across all platforms. We provide advice from the consumer’s point of view. When it comes to brand management, the challenge is to establish an emotional relationship with end consumers. They experience products at first in a store, which makes retail the start of the value-creation chain. Our focus is on one thing… Implementing the retail brand or marketing message that our clients require with a level of professionalism and quality that is unsurpassed. AGRetail’s creative agency team work closely with clients to create brands that have that inside-outside power. Brand creation goes beyond visual identity to encompass all its facets, from core values to the brands tone of voice, its not just how we look but how we sound as well. AGRetail’s brand implementation services cover consulting, audits, impact evaluations, branded collateral production, delivery and installation. Working with some major retail brands, our experience covers national and international implementation programs. Many of the largest retailers, business organizations and institutions look to AGRetail to provide a high level of brand management to ensure consistency across all platforms nationally and internationally.